Do you collect football or rugby shirts, your own or from your favourite side? Have your sports shirts framed at Renaissance 2. There are various methods and alternative styles. 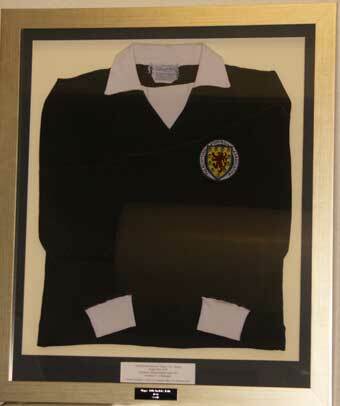 This is a Scotland international shirt recently framed for the player. The frame uses a specially made stepped moulding which creates a deep box effect. The top mount in black adds to the feeling of depth and is embellished with a plaque giving details of the shirt's history. A further commemorative plaque is attached to the frame. We use good quality wood frames (many framers use plastic) and conservation quality sheet materials so your shirt will stay in good condition for many years. The shirt is supported on the under mount using special tags which do not cause damage and can be undone in future if necessary (other framers will glue down the shirt onto a mdf former which destroys the value of the shirt). This method also retains a more natural look to the shirt which hangs naturally rather than being flattened against a board. This signed shirt has no top window mount but has 3 apertures in the under mount to display photos and title. 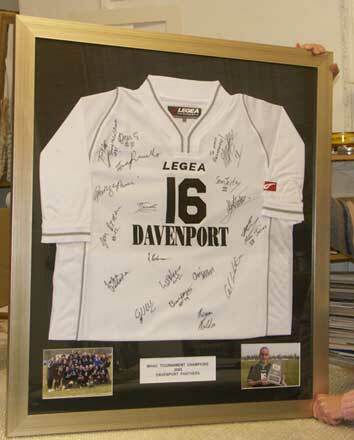 There are many ways to frame shirts and we are happy to discuss your requirements. We have also framed jackets, T-shirts, baby clothes, ballet shoes and a host of other items.